Antiques challenge. David Harper and Anita Manning go head to head as they road trip through northern England and into southern and central Scotland. with a couple of our old favourites, David Harper and Anita Manning. at the beginning of our big adventure. You have no idea what's going to happen. is meeting all the characters. It draws in the eccentric, doesn't it? she has certainly got an eye for a bargain. But does have a tendency to get distracted. It is all the hip action. One, two, three. Cor, what a mover. Ha! Her partner in crime is wheeler-dealer David Harper. He takes a more serious approach to his shopping. Is it a twizzly-wizzly? Look at that twizzly-wizzly! Oh! Ahem. Sorry about that, Roger. Our lovable oddballs are starting this journey with £200 each. the 1965 Morris Minor convertible. I think she's just a little beauty. I tell you what, this is like a glove to you. -It just fits you perfectly, doesn't it? I think I'm more Morris 1000 than Maserati. Oh, I don't know, Anita's known for being a bit racy. -I've got on a Marks & Spencer silk vest. Too much detail, I'd say. all the way up to the town of Paisley in bonny Scotland. and head towards an auction in Knutsford. Ramsbottom is actually believed to mean "valley of the ram"
I'm raring to go, Anita. Positively raring to go. I will drop you here, David. And I want you, on our first day, to have lots and lots and lots of fun. where he is meeting dealer John. -Hello, there, you must be John. -Very lovely to meet you. -What a gorgeous, sunny day. -Are you in a sunny mood? -Marvellous. Is that good for me? Right, David, let's get going. Look at this thing, it is completely unfashionable. But 15 or 20 years ago, everybody wanted one. It's a mid-19th century walnut, brass-bound writing slope. It is absolutely, to my mind, drop dead gorgeous. when, years ago, that would have been two or three or even £400. I've found fantastic love letters in things like this. Hidden away in secret compartments. What an old romantic. One to think about, perhaps. What else catches your eye in here, then? This better be good, this man cave, John. Do you know what that is? Without reading the label. Oh, no, no, I'm not. -That's right. It is a boot scraper. -Yes, it is very nice. boot pull and scrape. That's a bit of a tongue twister. -That sinks into about that level, yeah? -So it's nice and secure. You can scrape your boot on there and... You can remove your boot? -That's very good. Wrought iron. This is a proper man's cave object, isn't it? -What sort of money could that be? -I think we'll have to say yes, don't you? That generous discount gives David his first item. where she is on the hunt for a bargain in Bolton. She's visiting Bolton Antique Centre for a good old scout round. -I'm always drawn to jewellery, I always like it. -And I noticed that you had a couple of Robert Allison pieces. especially with a Celtic theme. Both of these brooches are absolutely lovely. They're Scottish brooches. Why have I been drawn to Scottish brooches?! quite a lot to blow so early on, Anita. -This one, I like it because it has the Celtic knot motifs. -This is my very first buy. The Celtic cross brooch is cheaper and priced at £65. What's the very, very, very, very best you can do that? 28? Let's go for it. -I'm so pleased about that. I bought a Scottish thing, my very first buy! That's a whopping £37 discount. Off to a strong start here, girl. -So, I've got one thing. which was a little pin with a wee diamond and pearl on it. We think that's possibly a South Sea Pearl. -Have you got it hallmarked? a diamond and pearl set stick pin. as it's got no hallmark. What is the best that you could do on that? -If it was hallmarked, I would be more encouraged to go with it. -But I still think it's a bonny thing. That's another great discount of over 50%! She's on a roll with Rosemary. You see these little horses, here. Little knife rests, would you say? They are, yes. A little set of four. -I think they're quite kind of fun. The only thing I worry a wee bit about is the age of them. -I've got a dilemma here. Set of leaping, crazy horses. What's the best you can do on them? Could I buy the two for 50? Go on, we'll do 52. -Thank you very much, that's great. and the stick pin for 40. Anita's already parted with almost half her budget. Back in Ramsbottom, David's search for a deal continues with John. -Eh, eh - car badges. Car-related stuff is good. They're from a very early vintage car, aren't they? so quality and durability were paramount. I'm looking for a maker's mark. -There's nothing shouting out, there's no plaques. -if you plumbed them in to a vintage car, they will work. Look at the lenses - look at that glass. -You can see, actually, that's hand-blown glass. John needs to speak to the owner. You can have them for £60. -Fantastic. Two purchases down, that's not bad going, is it? But there's still one more item on his mind - or heart, I should say. So, Gina. The 19th-century writing box. Any price on that? -We had a chat, haven't we? 55. It could make 60, it could make 10 quid. What about 35 and we'll give you a pound back for luck? Go on, then - whose hand do I shake? I'm going to shake your hand as well. So, 35 and a pound back for luck. This is old school trading, isn't it?! OK, come on then, mathematician - how much do I owe you? and 34 on the writing slope. He's also parted with quite a chunk of his budget. a town that rose to prominence during the Industrial Revolution. it forced many skilled labourers into poverty. to improve the lives of millions of people worldwide. -Welcome to the Rochdale Pioneers Museum. Was this one of the original cooperative shops? so they put all the ideas together into a really workable model. That's what makes the Rochdale Pioneers so important. textile wages for skilled workers had actually halved. and throughout that period, food prices were going up and up. So there was a lot of poverty around the place. decided to come together and form a cooperative. a rare turn of events in those times. -Now, was there a money box here? that they were getting fair weights and measures. a bit dodgy on their weights and measures. and these are the items that they sold? -There doesn't seem to be a lot on the shelves. They did not have very much money. There were 28 of them originally and they put together £28. A lot of it went on renting the building. they looked at the things people wanted, people needed to eat. They chose butter, sugar, flour and oatmeal. Those four things, staples of the life. -So there was a basic desire for decency and fair trade. And also fair distribution of profit. shared equally based on each person's input. were established at their weekly meetings. So this is the original minute book of the Rochdale Pioneers. which was August the 11th, 1844. -So this is the very first meeting? -And these were guys that were coming in after doing ten hours' work? to do work in the society. and many turned to copy their principles. and, more importantly, the promotion of education. getting together to learn from each other. and set up their own libraries as well. through their cooperative society was amazing. -wasn't able to provide them with? Yes, you could learn anything. They really wanted to change the world. As the Pioneers' fame went global, their movement also gathered pace. are now enshrined in common law around the world. David is heading to the picturesque town of Todmorden. clutching his remaining 61 smackers. Nicely spread out. Big, red walls. mixed with 18th-century furniture - it just works. -Now, you must be Roger. -Yes, how are you, David? but it's got a contemporary feel about it. That's the copper Art Nouveau Arts and Crafts dish. I mean, it's pretty standard fare, isn't it? it's got a bit of a modern look about it, hasn't it? -I think that's circa 1900, bang on. hand-beaten and it's got the Art Nouveau decoration. I'd have it for 20 quid. I would say yes and shake your hand right there. Let me just consult with Pamela, because she knows this person. Quite right. That would be a 50% off the ticket price. So, let's hope Pamela's feeling generous. Can I then, Roger, Pamela, buy it for 20? -Don't look, but say yes! Can I? Marvellous! Thank you very much! Lovely to meet you and do a deal. And, Roger, thank you for that one. A cracking deal, eh? Anything else that would suit his meagre budget? -How much have you got left? Give me £41, you can have that piano stool, which sells for 100. -I haven't seen the piano stool. -It's an American one - here. We're off somewhere else! Right. -..I bought for a lot of money. -But with a lot of other things. You had him at twizzly-wizzly, Roger. -That's all right, it does that! I thought I was spinning it in the correct direction. It's all right, that's what it does. and covers in the US. Such a maker's mark could add value to this piece at auction. -This is probably not far off American Civil War. Sometimes they're a mixture of things. or used by people who were there during the Civil War. -And how much is it? And that's all my money gone. A brave move spending all his money on day one. and it's time for our duo to rest up in preparation for another busy day. Well, for Anita, anyway. So, nighty night! but there's no dampening the spirits of our intrepid adventurers. -we have palm trees back there. -We do not have palm trees! We COULD be in Monte Carlo! but I suppose they do have a promenade. that I don't take you to glamorous locations! What is that all about? Did you sleep in? I'd like to say it was intentional, but I just forgot to shave! -You can have a feel, if you like. -Go on, have a feel! He may not be Cary Grant, but David did shop boldly yesterday. and Art Nouveau copper dish. Spending all of his £200 budget. Anita, on the other hand, was more prudent. leaving her with £120 to play with today. David and Anita have raced along to Wallasey and Anita's first shop. and is currently undergoing regeneration. Anita is meeting Tina at the aptly-named Tina's Treasures. Fingers crossed she finds some. And without further ado, she's off. Just like a kid in a toy shop. I like hats. I really like hats. What a lovely, smiley doll. This doll, she's so sweet. Hi! You're bringing a smile to my face. Tina, could you tell me a wee bit about this doll here? Yes, she made this range around the 1930s. But it's just beautiful features, isn't it? Really sweet. Norah Wellings was a highly esteemed soft doll maker. She designed all of her dolls herself. Her motto was, "Quality, not quantity,"
which obviously worked, as they're still very collectable today. Plenty more to see, though. Or play with, in Anita's case. I'm no good at that. No. -It's all the hip action. Are you actually going to buy anything, Anita? -Go on, make me an offer. and it's because she's such a cheery doll. The doll's priced at £55. Time for some serious haggling. 15 to 20 on it. to say 20 on her? -I'll do 20 on her. -That'll give you a chance, then. -That'll give me a chance. -You've got a new mummy! -And she's going to have a new home! -Tina, thank you very much. I think she's great fun. I've enjoyed playing with all these toys. -I'm so glad you have. -I've had a great morning. It's terrific! purchased for the bargain price of £20. is journeying across the Mersey. Even the Moggy Minor sounds throaty going through this tunnel. came from the Mersey and its maritime trade. of this wealth was derived from its transatlantic slave trade. But one unsung hero fought for equality and justice. Edward Rushton was a poet and revolutionary. even taking on the President of the United States. So, Alex, who exactly was Edward Rushton? Well, Edward Rushton was the man who dared to take on George Washington. -This is a portrait by Moses Horton. He was a boy who was at sea at the age of ten. was the capital of the slave trade. the cruelty the slaves were forced to endure. a boy called Kwamina, who he taught to read. and Kwamina actually saved his life. But in doing so, he lost his own. in particular the abolitionist cause. below deck due to a contagious eye infection that led to blindness. Appalled by their suffering, he insisted on taking them food. and lost his own sight. At what age? At only just 19. Rushton took on various jobs, including editor of a paper. a letter he sent to the first President of the United States. Well, of course - he'd just fought the War of Independence, hadn't he? apart from, quite obviously, the slaves. Huge contradiction. How does he go about this letter? "Shame, shame that man should be deemed the property of man. "among the list of such proprietors." Does George Washington respond to this? with no word of reply. both in the UK and in the States. to use that letter and reignites the abolition movement. was not the only movement Rushton was involved in. he couldn't help but rail against the injustices he encountered. than the plight of the visually impaired. that would have made life pretty difficult. there were no facilities in the UK to help the blind. Rushton campaigned to build a ground-breaking school. This was to open in January 1791.
would be trained to be self-supporting. Was this the first school of its type in Liverpool? It was, it was the first school of its type in the country. and the number of students steadily grew. This school had 45 students within two...three years. because they had 80 people on the waiting list. but he was remembered in the blind school and that is his legacy. until his death in 1814.
and is heading into Wayne Colquhoun Antiques. She's still got £100 left to spend. I'm great. I love 20th-century design. -Wayne, there's a rather pretty mirror here in a box. -Is it?! I've got good taste! Good taste that, yes, that's beautiful. It's a French one. -It's several hundred pounds, though. -What about something as simple as a cocktail shaker? All bright, it sort of sums up the age. -People would sit around and make their Martinis and things. Bet you do that at home now, yourself. Have a little shake and a shimmy. all those fabulous frocks and so on. I think she means she likes it. Because it's a good one, that. It's a good, thick plate on that. -Let's do 15, but I couldn't go much below 15. Could you go to 12? -Don't if you don't want to. Go on, seeing as it's you. I'll do £12! I knew I was in for a rough ride! -As soon as I saw you! an Art Deco cocktail shaker. cost her a total of £112. and an Art Nouveau copper dish. Let's start from the top - boring, the stick pin. and I don't dream about them. David has a mixed bag of items there. Some of which I like and some of which I think are...weird. I would guess, and a bit on the horrid side. at Knutsford Fine Art Auctioneers. or do you feel confident that you're going to blast forward? No, I'm not confident! No, I'm not! I was trying to pull myself up, there, but no, actually, I'm not. Get you right to the door, madam. who's had a look over our experts' lots. really unusual glass ball feet. Hopefully, that should do really well. And what of Anita's knife rests? Little bit of a gamble. I hope too much wasn't paid for those! First up is David's Art Nouveau copper dish. -Are you nervous? Are you nervous? At £18, selling now at 18. I want to shout, Anita. Yes, but it's a very small loss. Next, are Anita's leaping horse knife rests. £10. £10 for them, surely. -..gentleman's bid now at £28. Are we all done now? Selling at 28.
but Anita's more than doubled her money there. Well done. Well done, very good start. with her self-polished Art Deco cocktail shaker. Are we all done? Selling, £18. -Oh, check it. Well done, well done. Another profit for Anita. Cheers to that. You're on fire, missus. You're on fire. Back with David and his tongue twister of a boot pull and scrape. £20. £20, thank you, sir. Someone knows what he's doing there. -A long way to go. -Are we all done, surely, at £25? That's another loss for David, I'm afraid. Fingers crossed his walnut writing slope will put him back in the game. In the room, and 40, 42, 45, 48, 50. No, at...£55, on my left, selling now, are we all done? -He's got taste, this fella. David followed his heart and with that one, it paid off. -Back on an even keel now, aren't I? Now it is David's late 19th-century piano stool. A twizzly-wizzly, if memory serves. £40, surely, to start. Come on, £40. You all want it now, for £20. You, sir, right at the back at 20. 22, 25, 28, 30, 32, 35. No? It's at £42. A gentleman, fresh bidder, 45, 48, 50. After a shaky start, that's a second good profit for David. -I'm happy. I've been happy all day. Back to Anita now, as her Norah Wellings doll is up next. 20 then, if it helps. -On my left now at £28, are we all done? Anita has secured a profit on every item so far. the gas-powered car lamps were a bit of a gamble. £20 I have, at £20. Standing now, are we all done? 22, 25. -At £30, in the room now at £30. At £35, standing now, are we all done? -To tell you the truth, I'm surprised they went that far! had this auction been online. But let's see if Anita's pin will keep up her run of profits. -I call gentleman's jewellery, gentleman's furniture. 32, 35, at £35 on my left now, at 35. -Selling now at £35, are we all done? Anita's first loss of the day, but it's a small one. That was a big diamond. Well, it was a little diamond. -No, but you bigged it up, that was good. It's their final item of the day, Anita's Robert Allison brooch. £10. 10, I have, 12, 15. At £18 at the back of the room now, at £18. Are we all done? -The two jewellery pieces brought me down there. That's disappointing. Anita normally does well with jewellery. -This is a very complicated sum. -That's why I'm leaving it to you. -Have a cup of tea. -I'm going to come with you. And the numbers are in. Our two competitors started this road trip with £200 each. leaving him with £166.46 to carry forward. with £192.14 for the next adventure. -It will pop on your head. ..with some royally good results. 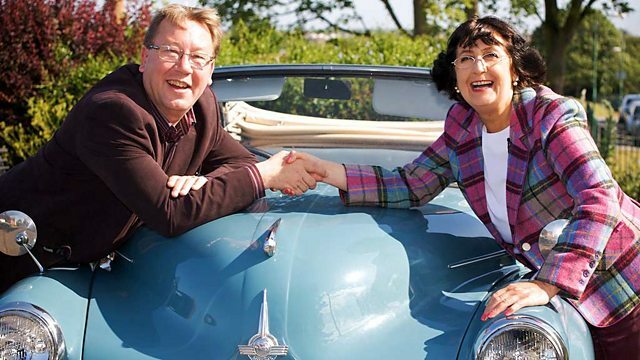 Antique experts David Harper and Anita Manning go head to head as they road trip through northern England and into southern and central Scotland. This first leg sees them travel through the north west and head to an auction in Knutsford, Cheshire.